We have taught many students how to prepare for ASQ exams. I’ve even taken (and passed) the Certified Quality Engineer (CQE) exam once, and the ASQ Black Belt exam twice (do not let your certification expire, or you will need to re-take the exam!). We often get asked what the best approach for passing the exam should be. I’m going to assume that you have some prior Six Sigma or statistics training, and you are looking for a way to refresh yourself on the topics. Since many people are now taking the Certified Six Sigma Green Belt (CSSGB) exam, I will focus a little more on that exam, but many of the tips apply to the Black Belt (CSSBB) exam. 2) Read every word of each chapter once. I would start at the beginning and work your way through the book in order. This will get you familiar with every topic and definition. Are you limited by time, or want to be more strategic in your efforts? 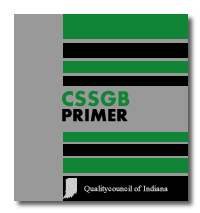 Since they provide you with the percentage of questions by section (according to the 2nd Edition of the CSSGB primer), start from the top of this list, and work your way down, focusing on the sections you don’t know as well. 3) After taking the sample questions, mark your book with a post-it note or post-it flag/arrow for keywords and topics that you want to retrieve quickly during the exam. There is an index in the back of the book, but some people find the post-its more helpful. The sections do not always seem intuitive based on their name, so don’t think that will be much help during the exam. They are a good representation of the type of wording and questions you will get on the actual exam. They may have been thrown out or poorly worded, so you will get frustrated with some of the answers. Therefore, don’t get too wrapped up in one or two questions. You will notice that reading the question clearly is very important. Don’t just skim it and think you understand what they are asking for. After taking the sample questions, check your answers in the primer, and review the questions you got incorrect. Read the explanation, and see if it makes sense. Go back into the primer and make notes about the question. Often times, there is a similar example in the training material that you can add comments in the margin. NOTE: You will not be able to bring the practice questions or solution text into the exam. It is open book, so almost everything else you can bring in for reference, except those two things. If you still aren’t sure why the answer was correct, seek out some help from people in your company or network who can help you out. We will be setting up some review sessions here in Portland (OR). If those don’t work in your schedule or location, please contact us for dates of online and on-site review sessions for your organization. 5) After reading the book, and taking the sample questions, you should feel comfortable knowing if you have a chance at passing. If you feel like you understand most of the content, and are getting most of the questions correct (at least 50% correct on the first time through), then you are probably ready to sign up for the exam. There is no official cut-off or % correct, since it is based on a difficulty rating, but the rule of thumb is around 70% correct. Study and prepare so you will get at least 80% correct, so you don’t push your luck. 6) After signing up for the exam, continue working on the problems you struggled with. Some additional training might be helpful, if the primer book is not explaining it very well. Again, check out the free online Green Belt training from BMGi. If you can’t find any helpful training on the topic, contact us and we’ll point you in the right direction. 7) Read the blog we wrote titled “15 last minute tips before taking an ASQ Green or Black Belt exam” at least one month prior to the exam date. Some of these tips are pretty simple, but it helps to think about everything, and be proactive. 8) Any additional free time should be spent re-reading and reviewing each section, with an emphasis on the sections with the most questions (see Pareto chart above). If you don’t know what a Pareto chart is, you should start planning to re-take the exam! There is a lot here to remember. Luckily, we have recently developed an “ASQ Six Sigma Exam Reminder System“, that will email you as the exam date nears, with these tips and tricks to help you pass the exam. Let us know if you have other tips or tricks that worked for you! Update 4/28/18: Found a good article about passing the ASQ BB exam, with many similarities and tips that would work for the Green Belt exam.